The Thursday before the Jewish New Year, there was a celebration in Jerusalem. The youth of Yesha gathered to salute the brave youth of Gush Katif. For 18 months I had seen the same kids gather to save their land. They were the most spirited young people in the land. They believed they could fight expulsion from their homes by the power of their combined goodness. Not anymore. This night they looked lifeless. Their spirit was gone. They looked like they had been raped. And they had been, non-stop, for a whole year. The thoroughly criminal leaders of Israel, governmental, rabbinical and media, had gang-raped the country this past year and it looks like they'll be coming back for sloppy seconds next year. I don't apologize for the crudity. Even it doesn't begin to describe what the body of Judaism has suffered in the past 12 months. It is half a day before the year ends. Today, I'll summarize the crimes and crooks through their felonies and the effect they've had on some people I know. Come Yom Kippur, I'll tell you how the criminality of the rulers has corrupted Israelis and ruined life in the country, focusing on one crooked printer and the effect he's had on me. Because, quite frankly, I've had it with this place and so has just about everyone else. Though they still claim to be clinging to divine hope. Yesterday I received a call from Tsfat. The man declared, "I'm not worried. We'll get Gush Katif back." "No we won't, " I quickly reacted. "When the moshiach comes, he'll return it and take care of the Arabs." A lovely thought, if it works for him. But the Arabs had nearly nothing to do with the expulsion from Gush Katif. Jewish soldiers did it all. Blind, degraded, cruel Jews did the dirty work. And somehow the caller missed the point. The delusion won't last the rest of next year when these same soldiers clear out the rest of Yesha. Earlier today, a friend called from Kedumim. He informed me, "Everyone here knows we're the next in line." "So what are you doing to prepare?" I asked. "Nothing," he replied. "What can we do?" That's just what I heard in Gush Katif. But there was lots to do. All that was needed was 100,000 people to fight back. 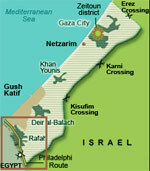 I was in Gush Katif just before the expulsion. I told a companion that I was considering staying to help him fight back the forces. "Where," I asked, "Is everybody sleeping?" The answer was, "Nowhere. You could try putting a sleeping bag on the beach." Within the answer was why Gush Katif died. They couldn't even organize a campground for their allies. And they didn't even try to. And either would Kedumim take the simplest measures to defend itself. They were too defeated. "It's all in the hands of Kadosh Baruch Hoo," my friend declared. "No," was my rejoinder. "It's all in your hands with His help." It is apparent that Kedumim wants to suffer the indignities of Gush Katif. And like the refugees of Gush Katif, they won't fight back even after their own expulsion. That would take spirit and a will to survive. 7 suicides in the army ranks as a result of the Gush Katif expulsion. My guess is that they knew things and were prepared to talk about it. This morning I attended a press conference given at Beit Agron, the site of the Israel news association. The main presenter was Itzhak Meron, one of the attorneys of the Legal Forum for the Land of Israel. This volunteer group is representing the Jewish exiles from Gush Katif and the Northern Shomron. The main point that needs to be spread across the globe and especially to our Jewish brethren in the US and elsewhere is that the government is willfully involved in a major disinformation campaign. Aside from having planned a very well executed military/police operation against this population NONE of the civil solutions for the post expulsion phase are in place! This means that over 95% of the nearly 10,000 refugees do not have a true permanent solution to their housing, employment or any of their basic needs (School for their children, health care,etc.). Sharon's 'government' has hired twenty public relations professionals to put out these untruths. One is Arad associates, Ramat Gan and the other is called the Israel Project out of Washington, D.C. All the major Jewish organizations have been fed the line that each of the expelled Jews left with $500,000 and are temporarily in luxury hotels and all will have a permanent solution by September 1st. You wouldn't believe it. I couldn't. But it happened. I was in NITZAN on monday evening. They inaugurated 2 synagogues and brought Sifrei Tora. Then there was a ceremony. Who spoke there, besides rabbis and MK Orlev? GOVERNMENT OFFICIALS INCLUDING ILAN COHEN (HEAD OF PM SHARON'S OFFICE) AND YONATAN BASI! ILAN COHEN WAS EVEN HONORED TO CARRY A SEFER TORAH AND TO PUT THE MEZUZA IN ONE OF THE SYNAGOGUES! HE SAID HE WAS REALLY TOUCHED AND EXCITED. BASI RECITED SOME PSUKIM. THERE WEREN'T MANY THERE BUT THEY CLAPPED THEIR HANDS AND NO ONE SAID A THING. HOW PATHETIC! Afterwards a few refugees came to ILAN COHEN and asked him to help them in finding jobs for them. Now how can Israel fight back when it refuses to believe that it is being dismembered by the international mafia of the Council On Foreign Relations? Just look at the list of CFR felons below behind the expulsion and consider the ghastliness of their crimes. Begin with Edgar Bronfman, who finagled billions of dollars from Swiss banks on behalf of Holocaust victims and kept every penny for himself. To obfuscate the larceny, he gives a little back to a program called Birthright, which brings Jews to Israel to be brainwashed for "peace." "For years I was a harsh critic of [Prime Minister] Ariel Sharon, and now I'm his biggest supporter," World Jewish Congress President Edgar Bronfman told Haaretz on Thursday. In explaining the recent change in his attitude toward Sharon Bronfman said that over the past six months the prime minister has proven to be a true leader, brave and clever, . The WJC President went on to say that God is on Sharon's side, as He is on the side of people who do the right thing. Bronfman, who is a prominent representative of the American Jewish community's liberal branch, praised Sharon as a person who realized that the diplomatic path he'd been on was errant and dangerous and shifted his political outlook. "In doing so, Sharon proved himself to be an honorable leader." "I love to be proud of Israel, and Sharon brought back my pride in Israel," Bronfman said. He went on to say that he expects the prime minister to continue advancing the reconciliation process with the Palestinians and that Israel will provide financial aid to the Palestinians. Bronfman said that the WJC Board of Governors will convene in Jerusalem in early 2006, and that the session will be devoted in part to showing support for Sharon, Bronfman said. Bronfman, 76, who is a major contributor to projects including Birthright Israel. And when Sharon needs some more illegal cash, who does he turn to but the CFR? Just before departing New York Sunday night, PM Sharon allegedly managed to violate campaign funding laws by taking part in a dinner at which participants donated well over the permitted amount. A report by Israel's Channel Ten television reporter Raviv Drucker last night provided a detailed report on the Sunday night affair. He related how the organizer and hostess - Nina Rosenwald - sent letters to selected invitees asking for $10,000 per person or couple, and how the 5th Avenue location was closed off for over an hour for what the police described as a "top secret" reason. Only the 15 invited couples were permitted to enter Rosenwald's apartment, after having paid the minimum amount in advance. Rosenwald is a member of the CFR (Council of Foreign Relations), The CFR's James Wolfensohn "saved" Gush Katif's greenhouses, only to watch in glee as they were burnt to ashes minutes after the IDF departed the area. Now look who brokered the deal; a foundation begun by the highly-paid EU agent Yossi Beilin and Oslo negotiator Yair Hirschfeld. Of Beilin's felonies, much has been written. Far less is known about Hirschfeld, so allow me to illuminate you. He is from Vienna and an informant of mine from Vienna knew him and his family intimately. "Did you know that Yair Hirschfeld spent his youth and adolescence in and out of mental institutions? He was known in the community as a very sick young man. And you let this mental case negotiate 'peace' for you?" Today: Wednesday, September 7, 2005 - Vice Prime Minister Shimon Peres: "James Wolfensohn has been for a relatively short while in his present capacity and should be credited with some important moves, which are unprecedented. "One: Most important is he saved the greenhouses. It was a complicated compilation, which was done with political guidance and private execution. Most greenhouses were saved and will be handed over to the Palestinians as a source of employment and of income. The purchase is being made by the private Economic Cooperation Foundation. Investigative reporter Yoav Yitzchak reported in the 8 February 2002 issue of Maariv that former Labor Party MK Beilin is drawing an annual salary of NIS 350,000 - NIS 400,000 from The Economic Cooperation Foundation (ECF), a Tel Aviv based organization that he formed with Yair Hirschfeld at the end of 1990. (IsraelNN.com) American Secretary of State Condoleezza Rice told Arab leaders on Thursday that the United States will pressure Israel to conduct further expulsions. (IsraelNN.com) Israel and the European Union will be starting negotiations over stationing European forces on the Philadelphi route in order to reign in the chaos that has developed on the border between Egypt and Gaza. There is a rumor floating throughout Yesha that the Sharon government cut a deal with the Bush regime and its CFR neo-cons. You attack Iraq for us and we'll expel the Jews of Yesha for you. Visit the following web site and decide if that was the case. Barry - hope you are holding up and continuing your work after the "selling" of Gush Katif...how about this piece on the UN - and did you know that our friend, Limor Livnat is head of UNESCO in Israel. Israel hopes UNESCO selection of ancient archaeological areas as world heritage sites will encourage international tourism By Tamar Treblisi Hadad Eight new Israeli archaeological sites were declared world heritage sites at the 29th world heritage conference of UNESCO . Limor Livnat, Education Minister and also president of UNESCO in Israel said that the selection is an unprecedented achievement for Israel. And where is all the cuddling with the foreigners leading? Guess who's back in Jerusalem? Transportation Minister Meir Shetrit, Palestinian Authority Transportation Minister Saed-Eddine Khurma and senior EU representatives will tomorrow (Wednesday), 21.9.05, at 12:00, at the Notre Dame Hotel (opposite New Gate) in Jerusalem, attend the dedication ceremony for a joint Israel-PA office for planning and promoting joint transportation projects. No civil war, my step daughter, Luz, calls it a "brothers" war. Don't expect there to be a civil war. What we are experiencing is a dramatic change in societal values--and Israel will never again be the same. When I first came here, Israel was called "the closest thing to democracy in the Middle East" and people actually believed we were becoming a true democracy like the US. People loved the soldiers, as they were made up of the common people and everyone considered every soldier a potential son or brother. Police were respected as the "good guys" and everyone was always available and willing to help the police or army if the need were ever to arrive. And so it goes...even the government officials were respected and people couldn't even imagine someone (except a "right wing extremist") assassinating someone in the government. The list goes on and on. Now, within a short 9 year period, the police get no respect from anyone I know of...I personally have no respect for them. The soldiers are in the position of being in a "love-hate" relationship with the general populace. Uri (my elder son) got out of the army with a less than honorable discharge as he refused to do anything he was told. Yoshi (my youngest son) refused to even enlist as is required by law. I also know of a number of other young men who refuse to serve. This is an all-time first in the history of this country! I have a friend whose son was of two young men who were machine gunned by a IDF helicopter a few years ago--we all suspect it was a "political" message to my friend. Political murders are at an all-time high. The murders are not committed by the "right", but by the left; and the left is actually running a mafia that is controlling the country. Mafia tactics are being used from everything including a seemingly endless list of political murders to our "disengagement" which, I am convinced, would not have been passed if it had been voted on by the general population. Many of us are now hoping to get rid of this spineless "democracy" and go to a true Torah government. Right now, I am just hoping Netanyahu will not make it back into a position of power. Just after Netanyahu was elected Prime Minister in 1996, he was immediately called to Washington, D.C. by President Bill Clinton (CFR). Netanyahu was strutting like a peacock when he got on the plane here in Israel and when he got off in the US. After the meeting with Clinton, he looked like a little whipped pup as he exited the President's office. Only later did we find out the details of that infamous visit..... Clinton laid out the law to Netanyahu and told him that if Israel didn't pull out of Hebron (a Jewish community that had existed in that spot for over 500 years), he would make life hell on earth for Netanyahu and Israel. Just to prove the point, he told the PM that he had already ordered the next El Al plane out of New York to be shot down! This Sunday morning, September 4th, 2005, four (4) policemen in plainclothes came to Nadia Matar's home in Efrat. She was told that she was under arrest, and had to come with them to jail immediately. Nadia asked to speak to her lawyer. When reviewing the arrest order, it showed no signature of a judge. The police left, promising to return. According to the arrest order, Nadia is accused of incitement to rebellion in her articles. Ariel Sharon has turned Israel into a police state. There is no freedom to criticize the Government. There is no freedom of speech. So the few of us who do care will do our best with the little we have. Yaacov Verker, Chairman of The Committee To Reinvestigate The Rabin Assassination, will provide a meeting place for anyone interested in participating. Call him at 050 5205591. The best I can do is sell my book Who Murdered Yitzhak Rabin at a loss to anyone willing to hand them out to educate the unconvinced. You can have them for $5 a copy or for any offer as far as I'm concerned. It's all I can afford to do. If November passes and the Rabin option fails, I'll start looking for something else to do anyway. What's the point anymore?